At Arts & Letters Live, humorists Dave Barry and Alan Zweibel, co-authors of Lunatics, leave the Dallas Museum of Art audience in stitches. Accompanying your husband to hear Dave Barry talk is an act of love comparable to a guy attending a chick flick. The Arts & Letters Live audience at the Dallas Museum of Art Saturday night was completely packed with mild, middle-aged, casually dressed couples like us, even spilling out into a video simulcast room. While I am passionate about comedy and even use it to manage my moods, to my hubbie comedy is like air: he cannot live without it. He consumes vast quantities every day. Comic strips, humorous writings, comedy video from sitcoms to stand-up shows, even podcasts of comedians talking to other comedians. I’ve become accustomed to laughter emitting from the other room and can always tell when he’s reading Dave Barry: cackles, lots of them, one after another, ending in a gasp. Dave Barry writes Rube Goldberg machines. He’s not a laid-back observer; it’s action-oriented humor. Things happen. A typical column will involve a seemingly innocuous incident that happens to set off a convoluted chain reaction in which one action compounds the next one, accumulating in significance, rounding to a punch-gut climax, with many human foibles —some shallow, some profound—revealed along the way. 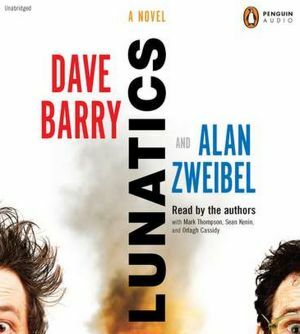 Which is a fair assessment of his latest fiction book, Lunatics, co-authored with comedy writer Alan Zweibel, the sly wit behind many legendary moments of film and television comedy. Lunatics launches from a challenged call at a kids’ soccer match, meanders into a drunken women’s book club, veers into a pet store called The Wine Shop, which results in a stolen out-of-control lemur, that leads to a diabetic woman on a sugar rush in pursuit of her insulin pump, which is ultimately blown up by police who think it’s a terrorist bomb. And that’s just the first 50 pages. Barry and Zweibel hit it off upon meeting at the Kennedy Center gala to present the Mark Twain Prize for humor to Steve Martin. In that rare instance of actually meaning those typical parting words—”Let’s do something”—the duo began writing Lunatics. Much like setting up an improv skit, a common setting was agreed upon—girl’s soccer, since both have daughters in youth leagues. Characters were determined: Zweibel’s nebbish Philip Horkman, a pet store owner, and Barry’s foul-mouthed Jeffrey Peckerwood, a jerk of epic proportions. Off they went in an extended improvisation spanning the east coast. In sort of a bipolar Rashomon, New Jersey-based Zweibel wrote the first chapter from his character’s point of view. Famous Floridian Barry countered with a chapter in his alter ego’s voice, continuing the story of their comically entwined lives. What ensued was a meandering and improbable plot, though nowhere near as bad as Zweibel’s infamous movie North. Plot has never been either writer’s forte. 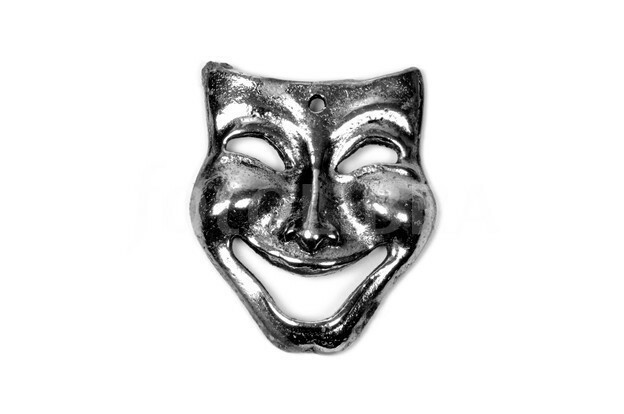 In true comedy improv style, frequently one would get their character in a bind and leave it to the other writer to remedy in the next chapter. Though Zweibel’s no slouch in the written word—his novel The Other Shulman won the Thurber Prize for American Humor—his main claim to fame is his work as a comedy writer who has crafted some of the finest works on television. Penning classic skits in the first five years of Saturday Night Live is a stupendous way to start. More recently he’s been behind such seminal works as Curb Your Enthusiasm and It‘s Garry Shandling‘s Show. Zweibel’s mastery of schlemiel humor was evident in charming stories of his early years. His parent’s extraordinary attempts to turn their good Jewish boy into a lawyer and failing totally were hysterical. He relayed being so desperate not to fail English, and thus get kicked out of college and into the Vietnam War draft pool, that he tried to pass off Paul Simon’s “The Boxer” as his own, a tale that had us in tears. 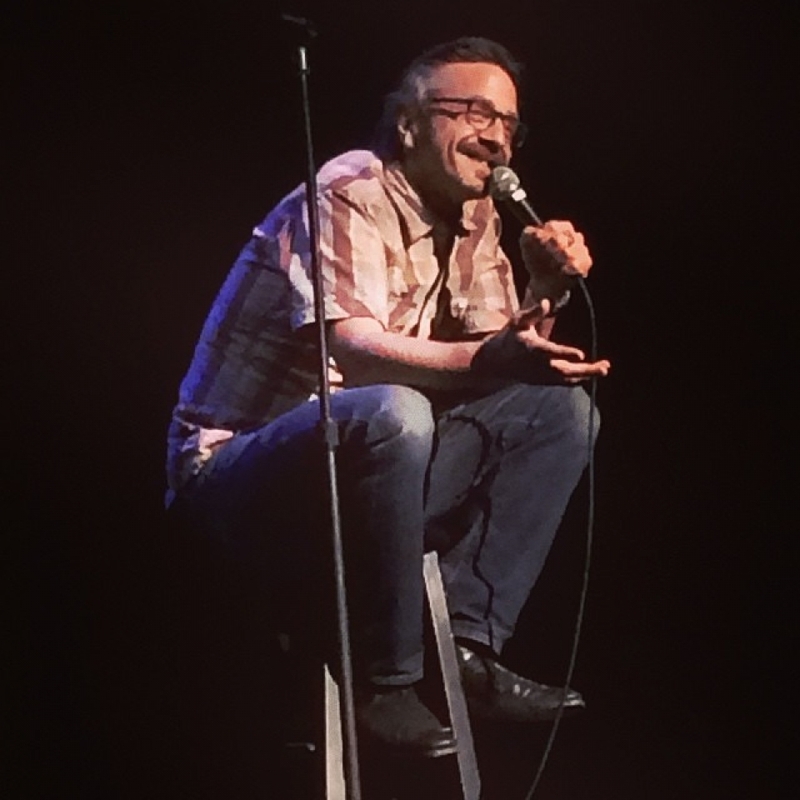 It was easy to resonate with his story of loving comedy, but finding that a job in the field writing jokes for Catskills comics at $7 a pop sucked that passion right out of him. Instead he switched to a slave-wage job slicing meat at a deli while trying to be a stand-up comic. Serendipity, and a crucial bit of help from Long Island neighbor Billy Crystal, landed him a job at the initial seasons of Saturday Night Live. From this, hubbie cleverly noted, Belushi’s “Samurai Delicatessen” skit must have been born. Zweibel extracts, refines and catalyzes humor from already great comedy minds and makes it stellar. He found Gilda Radner’s tender ludicrousness and showcased it in Roseanne Roseannadanna and Emily Litella, giving her the ultimate schlemiel line: “It’s always something.” He kept the maudlin in balance in Billy Crystal’s Tony Award-winning 700 Sundays. Someone should bring him back to talk about comedy writers as the wizard behind the curtain of better-known comedians. The evening was a classic contemporary literature presentation: Introduction by self-depreciating local media celebrity, remarks by the featured author(s), followed by light conversation and finally an audience Q&A. It was all served up in understated faux living room style with two low armchairs, unobtrusive coffee table, and rug in neutral tones, all of which receded in the amorphous lighting.